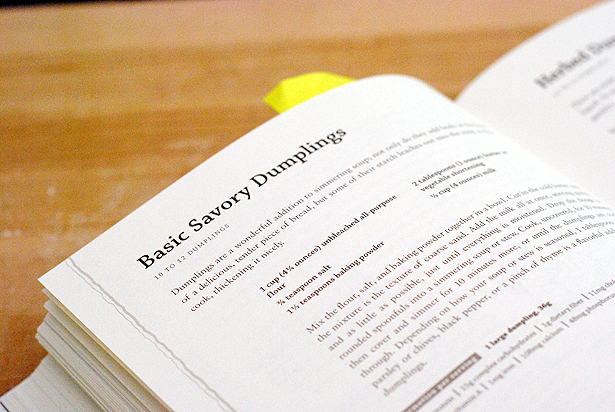 Everyone has their favorite chicken and dumplings recipe. I’ve even blogged about what I thought was mine. But the other night, come 5:30, I was struggling with dinner ideas when an intense craving for chicken and dumplings hit me. With the nearest Cracker Barrel over an hour away, waiting for The Brit to get home and then making that trek was just not an option. But that craving would not abate – so I started simple and quick, with organic chicken stock in a box. Then, I simply let my hands, and my gut, take over. There are surprisingly few ingredients in this recipe, and when it was cooking, I just prayed it would be a serviceable dinner. Instead, my friends, it was the most perfect version of chicken and dumplings I’ve ever made. No one was more shocked than me, I assure you. The soup was ready to go in under a an hour, and I just let it simmer until The Brit got home from work, making and adding the dumplings just before we were ready to eat. Fall is here on the East Coast – I feel more ready than every with soup like this in my weeknight repertoire. What are you most looking forward to cooking this Autumn? Come join the fun at the My Baking Addiction and GoodLife Eats Holiday Recipe Exchange sponsored by Le Creuset. Put stock in a large pot. Add diced vegetables. Rinse chicken breasts with water and add them directly to the pot to poach. Add Bouquet Garni and salt & pepper to taste. Simmer on medium heat for 30-45 minutes, until chicken breasts are cooked through. Remove chicken from pot to a large plate. Shred chicken apart using two forks to pull. When all chicken has been shredded, add it directly back to the pot. Cook the dumplings as directed below. Mix flour, salt and baking powder together in a medium bowl. Using your fingers, cut in the cold butter until you form pebbles that resemble course meal or cracker crumbs. Add the milk, stirring until just combined. There will be lumps. Drop the dough into the simmering soup by teaspoon or tablespoonfuls (your choice on size of dumplings) and cook for 10 minutes uncovered. Cover the soup and simmer for 10-12 minutes more, until the dumplings are cooked through. Enjoy over mashed potatoes if you like. We did. I am making this asap. After a week without power (and just getting it restored), I need some simple, delicious comfort food. Fall is quickly encroaching in New England and this is would be the perfect dinner for the cool nights. Elizabeth, we’ve been in the same boat. We got power back early Thursday morning, but it wasn’t ideal, because the tree that fell on our property was still laying on the line! It took until yesterday afternoon for them to finally show back up and cut the line free of the tree, so now we begin the process of cleanup and repairing our retaining wall. Our car was also totaled. I hope that power (and perishable food) is the worst you had – it’s been a hard time on the East Coast, hasn’t it? Please know that my heart is with you, and if you need help with anything, let me know. James and I feel we actually escaped this whole thing better than most because we didn’t have water or *house* damage. We want to help wherever we can. We are doing very well, thank you :), and we are one of the few lucky ones in the area. A twig fell in our yard, while most of the roads in my town were closed due to downed trees, power lines, and severe flooding. The last few of our neighbors just had power restored and cable is finally back on. We have a deep freeze in the basement that we preloaded with a lot of ice and most of the food survived. Anything that wouldn’t, I grilled – so we ate very well for a week. Steak with mussels over linguini, even managed excellent rice and stir-fry as well. But this Chicken and dumplings just hit the spot! Filling, simply delicious and incredibly light! My old (note the term “old”) recipe had me dragging out the cast iron, with chicken thighs (bone and skin) along with a lot of frying involved. I will probably add mushrooms in the future – but everybody in the house loved this meal! Sounds delightful! I can’t wait to make this as the weather cools down. I bet the kids will love it, Shaina. Hmm… I have never had chicken and dumplings. I am afraid of the whole dumpling part because they seem like they would be mushy (I have a weird food texture thing…). But, after seeing your recipe, I am willing to give it a try. For me, fall is all about pumpkins. As soon as we get past Labor Day (i.e. on Tuesday), I will be breaking out the pumpkin and doing some serious fall baking! How do I describe them.. dumplings are pretty much like biscuits, just without the crunchy exterior. Maybe make it for Darron and try just one dumpling to see how you like it? 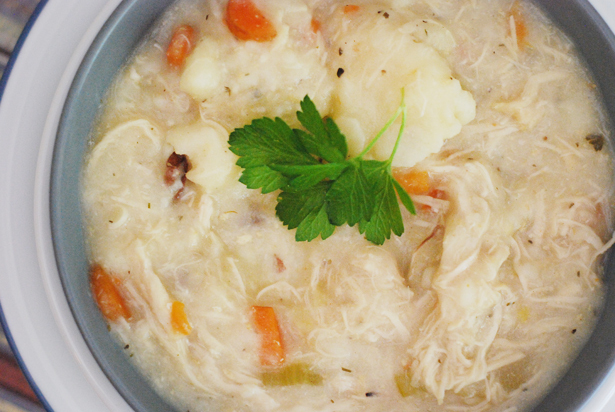 It’s pretty great chicken soup even without the dumplings. Pumpkin baking is definitely happening in my kitchen this weekend. I actually think pumpkin is great any season, but as far as I’m concerned, Sept 1 is fair game as far as Pumpkin goes. You’re a natural! Talk about perfect comfort food. I might serve this over some roasted winter squash. Delish! My Mom made chicken and dumplings last time she came to visit. My children were so impressed. 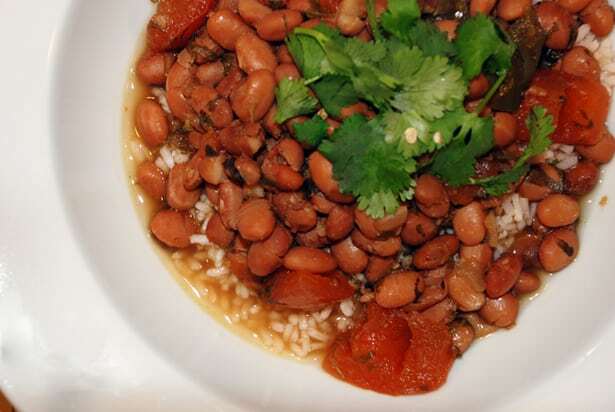 I don’t make them very often but I sure like to eat them, so comforting and delicious. I will have to try out your recipe, it looks perfect! Hope y’all are doing okay, thinking of you bunches. Miss, you should make them! SO easy! Thanks – we’re doing okay. Much better than most around here, and for that, I feel humble. Ditto, ditto ditto. Love how quickly it comes together. You’ll be able to chop up the veg during naptime, and just throw everything into the pot together about 40 minutes before you want to eat. What I like most is the almost-instant gratification. No smelling the food for hours before you can actually eat it! Hahah that’s awesome. Maybe you can get him to try the soup without the dumplings? Just plain good. We’re long from fall but maybe if I make these mother nature will take a hint. I’m a little jealous of the weather over there! This looks wonderful! SOmetimes our best dishes come form letting our fingers take control. Thanks so much, Andrea! It’s true, it really is. Mmmmm yummy! I am all about comfort food today. I woke up with a horrible sore throat and would just love if I had a bowl of this for dinner. Katie, I hope you’re feeling better! I wish I could bring a pot of this over for you. We’re doing okay, hon. Blessed really by comparison to what some other folks are dealing with. Aww Casey, I’ll make this for dinner when we have you and Dan over, so long as it’s not on Dan’s banned food list? This is comfort food at its BEST! So it takes a little time … it’s not complicated and the results are fabulous. Thank you for sharing. Fall is coming FAST! Donna, exactly. It made me so happy, that first bite. That’s what comfort food is all about. I love Fall – it’s my favorite season! This looks so delicious! Total comfort food. Been thinking about you! Hope everything is getting sorted out and taken care of quickly. Rachel, it IS so delicious! I was just telling Tina above that we’ve made it again since I wrote this entry. Addictingly easy dinner! We’re doing okay – much better than a lot of New Jerseyans. I just hope they all get FEMA help. This is definitely a dish that you just let go and your heart guides you through. I think it’s in our blood. This is my alltime favorite meal! Been thinking about you lots dealing with the storm damage. Let us know if you need anything. Tina, thank you so much. We’re doing okay. We finally have power back and the tree is no longer sitting on said power line. We’re doing a lot better than other folks around here with tons of water damage. I’ll take that darn tree any day over flooding. I can’t believe there’s no Cracker Barrels in Cali! That’s insane. I love chicken & dumplings so much, I made this again on Sunday night for dinner (the night before the tree fell). We were pretty sad to throw out the leftovers the other day.